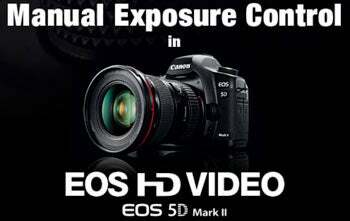 Canon said today that it would give a free firmware update to users of the hallowed EOS 5D Mark II camera, allowing them to shoot in full HD using manual exposure controls including ISO, aperture and shutter speed. Some notes: This is great news but there's no word on whether the Rebel T1i, with the same sensor similar video capability, will get the upgrade. This upgrade doesn't up the "full HD" 1080p to 60 frames per second—it stays at 30fps as far as I know. The auto-focus issue that we encounter in all DSLRs that shoot video is still present in this one, although Canon's solution is currently better than others. And finally, the Nikon D90 lets you do some of this stuff now, as we saw, but as Canon alludes in its statement, the D90 isn't full frame, and it's just 720p.